Currently in its second edition at ODC Theater, Dance and Diaspora provides opportunities to reflect on issues of cultural identity through the lens of dance and celebrates the multitude of voices that are born out of diaspora. On February 1st and 2nd, this year’s edition showcases two Iranian-born choreographers and performers, Farima Berenji and Shahrzad Khorsandi. Dance as an art form was banned in Berenji and Khorsandi’s native Iran after the 1979 Revolution. Like Berenji and Khorsandi, many artists and intellectuals fled the country during that time. Their relocation raises critical questions about how diaspora affects the making of art: What is preserved from one’s native dance form when it has been uprooted? Because of their context, are all dances born out of diaspora rendered political? How is identity shaped by displacement and translated into an artwork? In anticipation of their performances, Berenji and Khorsandi provided thoughtful responses to these questions, as they spoke about their work, and shared some of the rich history and background of Persian dance. MT: Shahrzad, can you talk about some of the specificities of Persian dance? SK: There are several types of dance in Persian culture: there is folk dance that is regional and tribal, there is social dance, and there is what I call art or classical dance. This is a very vague term, as there isn’t any standardized or codified style that you could call classical Persian dance. We sometimes use this term to distinguish a particular staged dance style from social and folk dances. But it opens up the door to ambiguities. Nevertheless, there are definite aesthetics that are specific to this culture, such as the curvilinear patterns you see in Persian paintings, calligraphy, architecture or textiles. In dance, these aesthetics are found in the types of shapes and lines that the body creates, in the transitions between movements and in the relationship between movement and music. MT: There seems to be an emphasis on the arms, wrists and hands in Persian dance, whereas dances from other Near Eastern cultures involve movements from the hips and pelvis? SK: Yes, there is a lot of emphasis on arms, hands and wrists in Persian dance. Hands are very expressive. That’s something that sets Persian dance apart from Western dance where the hands are usually not used to punctuate the dance. There is also a lot of rhythm in the feet that sometimes get ignored because one tends to get mesmerized by the movement of the arms. The uneven patterns and rhythms of the hands and feet reflect the tension that is very present in Persian art and culture. You often see it depicted in poetry: there is a conflict, a yearning for love, a tension between what you want and what you are able to get. 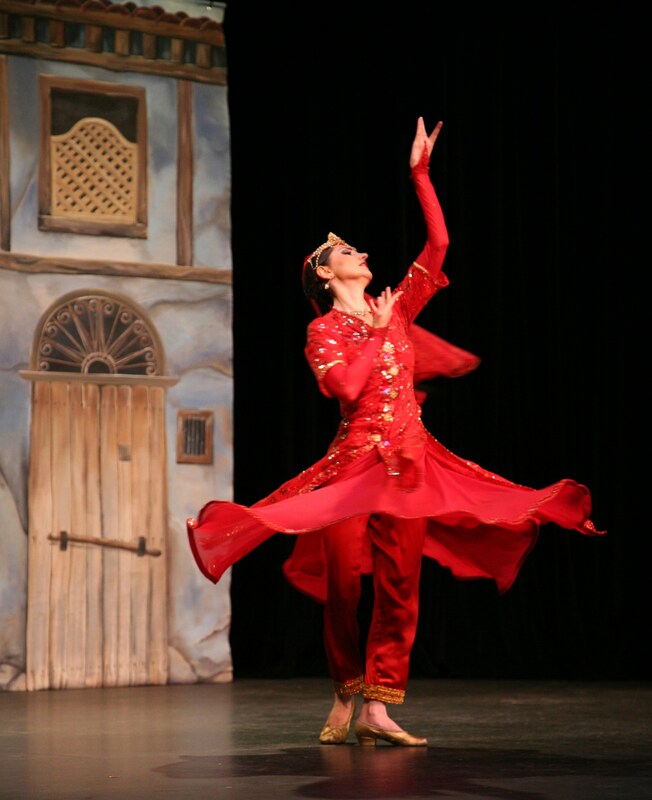 MT: You have trained in both Western and non-Western styles, from modern dance, jazz and ballet to traditional Persian dance, and created a style that you call Contemporary Persian Ballet. Can you tell us more about it? SK: I’ve been trying to find the right title to define what I do and that’s the closest I could come to. 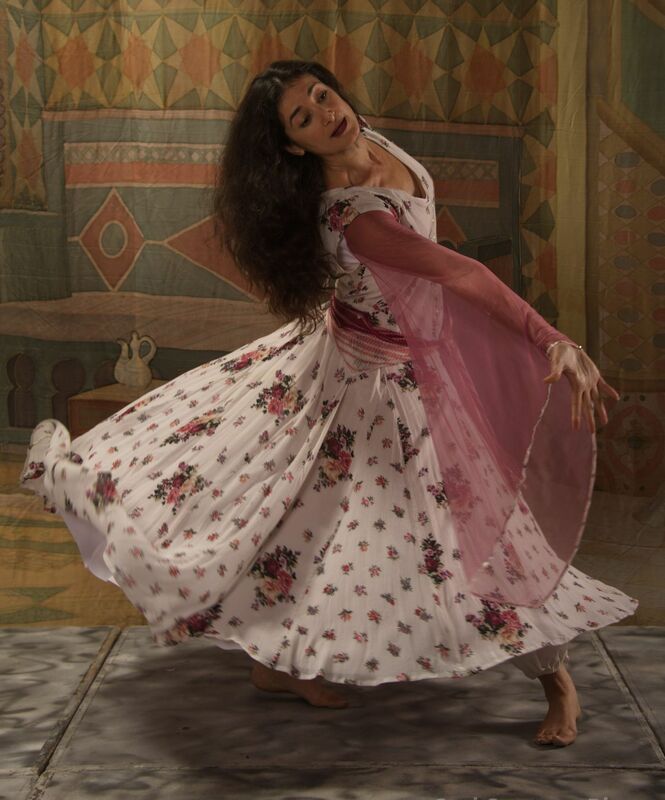 It seems to me that there is a common misperception when you talk about Persian dance, that somehow you have to do something historical and your costume needs to date back from the 17th century. But there is a current Iranian culture, and nowadays Iranians don’t dress like in the 17th century. So what I am trying to do is find out what makes a dance Persian without having to go back in time. The style I create is very much founded in Persian aesthetics but it is done in today’s community. Additionally, I use the term ballet because it implies that it is a structured dance style. It’s not made to be thought of as a fusion with Western ballet. But I have established a curriculum, arm positions, and a nomenclature so that people who are interested in this style have some guidance and steps to follow. MT: What particular elements of Western dance did you choose to incorporate in the style you have created? SK: My training in Western dance has given me a method to analyze movement and be able to explain Persian dance to someone who is not from that culture. In terms of movements and styles, certain elements are universal and fit into the context of Persian dance very well, like the concept of under curve and over curve in Eric Hawkins’ technique or the fall and recovery from release technique. MT: Farima, aside from being a performing artist, you are a dance ethnologist and archeologist. Part of your work entails excavations of Near Eastern archeology, with the intention of preserving ancient and mystical dance. Can you share that process and some of your discoveries? FB: I do research, work with the United Nations and go on digs as I am very much interested in the roots of Persian dance. We inherited these folk, social, or traditional movements, but where did we get them from? As Shahrzad mentioned, hands are very important in Persian dance. But why is it so? The discoveries we made showed that in the Elamite empire, you could not talk in the royal court, and could only communicate with your hands. Communicating this way was a sign of respect. Eventually these movements came into the theatrical world. MT: The Lioness project originated from your intensive archaeological excavation that revealed legendary ancient heroines, women warriors and amazons of Persia, Mesopotamia, and the Near East. Your work gives a voice to women who have been erased from history for political or religious reasons. What did your research reveal about these women? FB: If you look at Persian history, there was a time when women ruled the land. They had power over men, they were known to be the living goddesses and the earth was known to be Mother Earth. Women were generals, empresses, or priestesses. Whirling, for example, was done by priestesses way before the Sufis overtook these movements. Women brought ritualistic movements into this world, which was important for me to show, as no one ever talks about the dances they created, such as the dance of the lioness or the dance of the warrior. A lot of the movements we inherited are directly drawn from the trainings these women went through to prepare for war. Sadly, because of male and religious power, these women were wiped out of history. Or they were labeled as witches, or whores and their dances were considered as sins. There was a rewriting of history placing the male as the central figure. All the female gods were changed into male gods. I wanted to bring these women’s experience back into the discourse. Through my archeological work, I found carvings, and tablets that showed the movements they performed. I participated in a dig in an ancient town, called the ‘burnt city’ near Kurdistan, where Iranian amazons were buried with their shields and swords. I recreated their dances. It’s important because it’s part of us. It’s dying and no one knows about it. MT: In her article entitled Persian Dance and its Forgotten History, Nima Kiann mentions how the current political situation in Iran has “toned down the interest for a profound research effort.” Have you found yourself subjected to restrictions in your archeological work? And how challenging has it been to claim some of your discoveries, which include findings that give women a much stronger voice than the one they are currently allowed in Iran? FB: In one way, it was challenging because there were times when I needed to do research in a certain area and my request would not even be taken into account because I am a woman. The only way I could go back and access those places was with a man. Yet, it was not as hard as I thought it would be, because when I went on the digs, I started to communicate with the villagers, not with the authorities. They told me stories, took me to places where no one had been, showed me the dances they cannot perform anymore. I remember an older man telling me about what he saw in his childhood, showing me books that have never been published. One of them was a book of poems by Rumi’s teacher, which contained amazing movements and teachings about dance healing and music therapy. MT: This reminds me of the words of Iranian-American visual artist Shirin Neshat, whose photography and video work address the complexity of women’s experience in contemporary Islamic societies. In a speech she gave in 2010, she stated: “Every Iranian artist, in one form or another, is political. Politics have defined our lives.” After what you have shared, I imagine her statement rings true to you? SK: Yes, just the fact that we are dancing is political! Formal presentation of dance by women in Iran is outlawed. FB: Even if we try not to be political, somehow our work becomes political. For me it’s more important to convey the woman’s point of view and to question why Eastern women have been looked down upon. People may watch the dance and say “oh it’s beautiful, it’s very pretty.” Yet they are not aware of the pain and suffering women have gone through to bring forth these movements: thousands of years of suffering to look pretty! Women were killed, stoned, crucified for dancing these movements! MT: You are performing within the context of Dance and Diaspora. Born in Iran, you both immigrated to the United States when you were respectively 11 and 3. As an artist, how has diaspora influenced your work? FB: If I had stayed in Iran, I wouldn’t have been able to do what I do. Being here gave me the freedom to speak my mind. Like Shahrzad, I was stuck between two worlds. Because of my work, I often travelled to Iran and I would start building relationships there. Then I would be back here. I was able to put the pressure, hesitation and suffering caused by this back and forth into my dance. MT: Neshat touches upon the juggling between two cultures. While denouncing the government of her country, she also finds herself critical of the distorted Western perceptions of Iranian identity, women or religion. As Iranian-born artists living in the United States, does her experience resonate with you? If so, how do you navigate the potential misperceptions and/or generalizations of American audiences? SK: I came to the United States when I was 11. You have one foot in one’s culture, one foot in the other. You go through a phase of wanting to belong, so you renounce your own background for a while. That goes on until a certain age, when you realize there is a void. For me, it happened when I went back to visit Iran after 13 years. When I first left the country, I thought that I would never be back, the whole country was blowing up behind me. Then, the war between Iran and Iraq started, so there was no way to go back for 8 years. When I finally went back, it opened up a door to new understandings. There is always this balancing act to try to understand yourself: how much are my behavior and thinking dictated by the fact that I am Persian? A woman? An artist? When I talk about Iran, I generally encounter a lack of awareness about its culture and history. People frequently mistake Persian dance for Egyptian belly dance. Another misperception I often come across is that Persian women are submissive. There is for sure a definite reality when you talk about the government’s laws in Iran: for example, it takes two female witnesses to equal one male witness; a woman cannot legally divorce her husband without his permission. At the same time, it is not that simple. Women have a lot more power than it seems, in a different way. The woman runs the household. When you look at a family, you generally see the man running around and doing all the things that the woman wants. 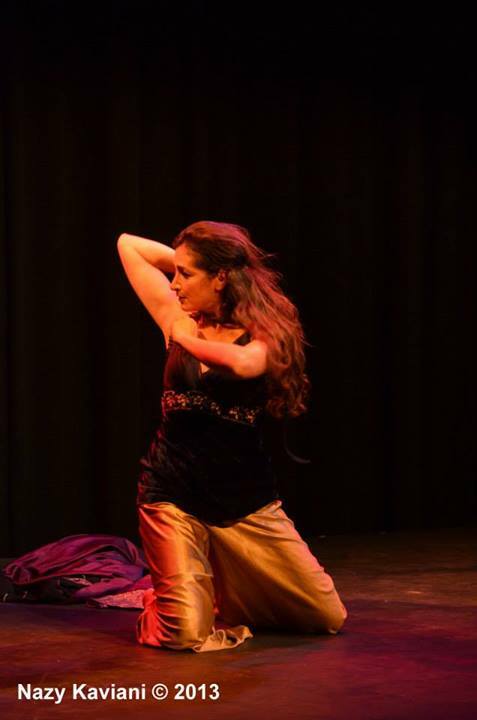 MT: Farima, in Rosanna Gamson’s Layla Means Night, presented at ODC this past fall, you twirled. 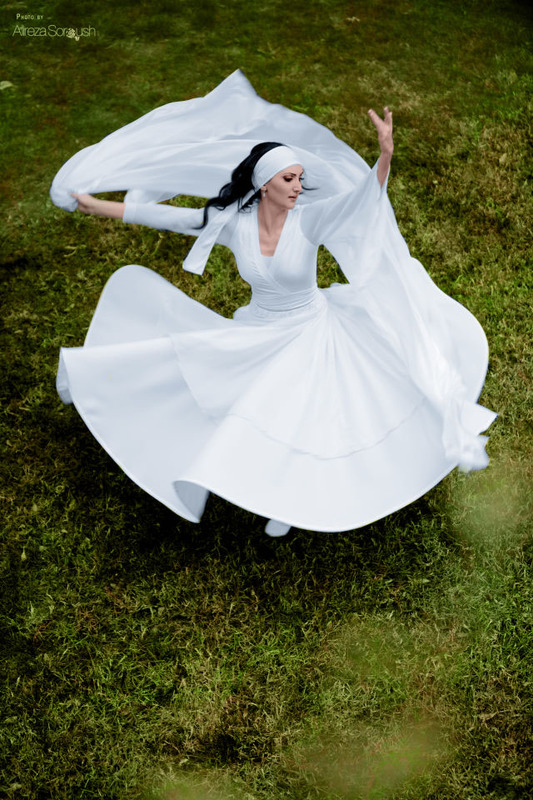 Spinning is also performed by Sufis as a way to “become one with God.” Can you talk about whirling and its relationship to the sacred? FB: The concept of whirling dates back thousands of years, and is linked to Mithra, the goddess of light. Back then, women were turning. In the dance, you turn to the left, as a way to align with the universe. It relates to science and astrology, as planets turn to the left, except for Venus, which turns to the right. The ancient priestesses realized the connection with the universe by looking at animals: dogs, snails, and butterflies, for example, also turn to the left. The turn was developed as the connection between the soul and a higher power. The performer wears white as a reference to unity, virginity and purity. This concept eventually became Sufism. In the Turkish tradition, the right hand, which is the hand of God, faces up to receive the blessings, while the left palm -the karmic hand- is turned down. You create a whirlpool around you. I bring the whirling into performance because this is the dance of the soul and the soul needs to dance! It’s the only time we can truly communicate with ourselves. MT: Would you liken it to other forms of meditation, where there is a similar attempt to remove one’s ego to connect with a higher power? FB: Yes, this is a moving meditation. The Sufi ceremony is called Sama, which means “to listen.” It is an act of letting go. The black shroud that you wear is a sign of ego. You take it off to spin. As you turn, you surrender. It is another form of improvisation, because you can’t make a choreography out of whirling. If you truly let yourself go, the energy takes you. Movements become improvised. The whirling you might see on Saturday night might not be the same as the one you see on Sunday night.